The Rumored Apple Smartwatch Design Is A...Snap Bracelet?! Ah, the snap bracelet. What we'd always thought of as a childhood novelty looks like it might take the spotlight once again, being cast as a possible model for the high-tech Apple Smartwatch. It looks like a recent patent discovery from August 2011 by Apple Insider is cluing folks into the possible design marriage between computerized mechanics, a flexible wrap-around display, and spring-like capabilities. Sounds perfectly Apple-esque to us! 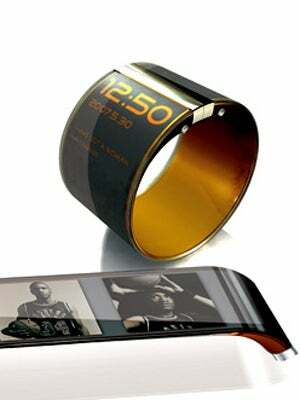 While they had us at the mention of a slap bracelet, whispers of a kinetic charging system — a.k.a. the watch would stay powered by the natural movements of your arm — have us more than intrigued. Throw in a continuous display system that can sense which way your arm is pointing and wireless communication with your smartphone or tablet, and we’re sold, per usual!